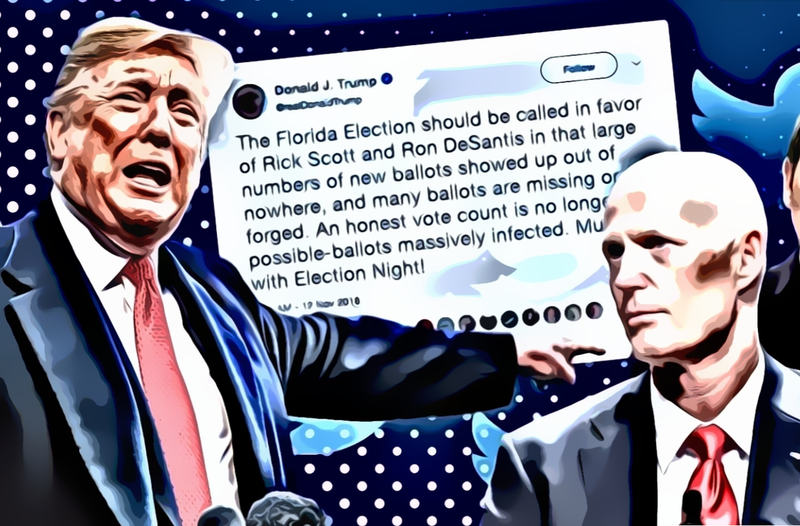 The US President called Florida ballots from the midterm election “massively infected” and said recounts should end in races for governor and US Senate. According to the White House, Republican Rick Scott, the governor who campaigned to unseat Democratic Senator Bill Nelson, and Republican Ron DeSantis, the House member running for governor against Democrat Andrew Gillum, should each be declared the winner in their races. “An honest vote count is no longer possible-ballots massively infected.” Trump tweeted. Most of the Republicans anger was directed on the Democrat-leaning Broward County, and its Supervisor of Elections, Ms Brenda Snipes, a Democrat who, importantly, was appointed in 2003 by then-Republican governor Jeb Bush. Critics have suggested the slow pace of ballot-counting in Broward is suspicious and say this is not the first time the county is getting into trouble. Ms. Snipes in response pointed to the fact that she has been re-elected four times. According to the explanation of Broward County officials, this year's count was encumbered by the unexpectedly high turnout for a midterm election and the unusual length of this year's ballots, which contained 12 state constitutional amendment proposals, partly as a result of a constitutional revision commission that meets only once every 20 years. Some even pointed to the makeup of the ballot (see our related coverage). Ms. Snipes, the recipient of Republican ire, acknowledged Monday evening that "there have been issues that haven't gone the way we wanted. You can call it a mistake or you can call it whatever you want to call it." When asked how she felt about the President’s remarks, Ms. Snipes said: "we're in an era where people oftentimes speak without having vetted the information, so I'm not sure where the president gets his information from." Candidates Scott and Nelson also responded to Mr. Trump’s tweet. Republican Rick Scott had already claimed victory on election night, and has since accused election officials in Broward and Palm Beach counties of "rampant fraud." He asked the Florida Department of Law Enforcement to investigate and his office has filed multiple lawsuits. Mr. Scott's lawyers alleged that Ms. Snipes was engaged in "suspect and unlawful vote counting practices" which clearly violate state law and that she might "destroy evidence of any errors, accidents or unlawful conduct." His Democrat opponent Nelson said Governor Scott should recuse himself from the recount: “Given his efforts to undermine the votes of Floridians, this is the only way that we can ensure that the people’s votes are protected." “He’s thrown around words like voter fraud without any proof." voter fraud has been rampant in that county for years. what did GOVERNOR Scott do? nada… now he's paying a huge price. MAYBE THEY ARE NOT GETTING AWAY WITH IT. MAYBE THEY ARE BEING GIVEN ENOUGH ROPE TO HANG THEMSELVES!! WE CAN ONLY HOPE, BC WE ALL KNOW THIS IS A TOTAL SCAM BY THE REPROBATE SERVANTS OF SATAN !! !